As the primary element of your project, the foundation is critical in creating a solid base from which each project can be achieved. 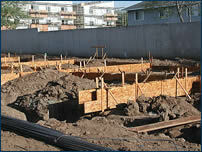 To that end, Ikon Concrete Design focuses significant attention on fabricating stable foundations at each job site. 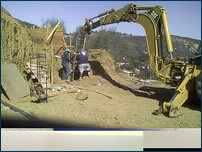 As the first step in laying foundations, the excavation is crucial in realizing the success of each project. Regardless of what each project entails, it is always necessary to conduct excavations with precision markings to avoid over or under cutting, thereby minimizing additional digging as well unnecessary labor and materials. Ikon utilizes the latest technology with respect to equipment and training for every project with the underlying goal of achieving the customer’s satisfaction in the most efficient manner possible. From precision drilling for caissons, to custom or pre-fabricated cages, Ikon secures foundations with an attention to detail that provides for solid, well-designed footings and grade beams. Whether your foundation lies on flat earth or a hillside, Ikon is committed to creating only the securest of foundations for your project. Used primarily for hillside construction, Ikon’s knowledge and experience allow for the most effective application of the Grading Observation’s findings. Through pre-fabricated cages order through existing manufacturers, or even custom created cages, Ikon customers rest assured their homes and businesses are built with stability in their foundations. 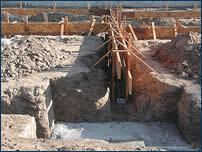 What most see as the traditional “foundation” of most projects, slabs are truly another piece in the puzzle. From the traditional approach of pouring foundations with an eye towards covering them with other flooring options, Ikon offers the option of using the slab as a finished flooring option itself. With the addition of stamping, coloring, staining and sealing, the options are limited only by imagination. Of course it would be remiss to fail to mention the significance of soil conditions, as well as the necessary preparation work such as vapor barriers and back filling in fabricating foundations. To that end, Ikon prides itself on utilizing the latest technology and equipment to achieve a level of precision and reliability that allows its customers to rest easy with confidence in the structural integrity of their projects.